For the first time ever, I have managed to sort out Christmas presents for my nephews and niece in good time. 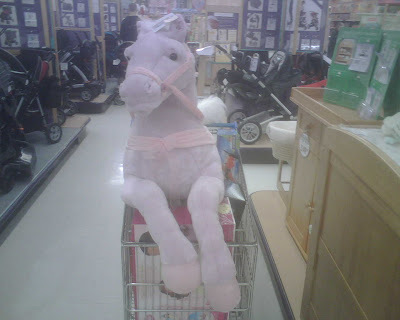 The Internet helped a lot but I had to pop into Toys R Us in Chatham to pick up a few more bits and pieces and found the most amazing gift for my little niece - a 3ft long lilac horse!!! 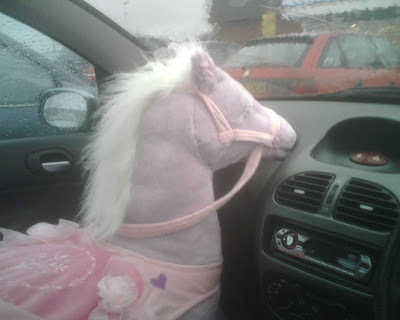 I am sure she'll absolutely love it - and if she doesn't, I know her mummy will! It was a nightmare getting it from shelf to checkout to car but at least I provided some fellow shoppers with a reason to smile and pass comment. Goodness knows how I am going to wrap it. Thankfully I didn't break down on the way home - that really would have given the rescue serviceman something to smile about! I am so pleased that our local Toys'R'Us provided something suitable. I have to come clean and admit that I sometimes pop in there myself, with no real excuse other than my hope to find something worthwhile that I don't already have from one of my favourite series -- Pokemon and WITCH in particular.